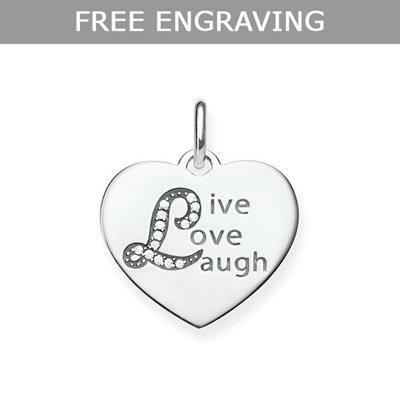 This 925 Sterling Silver heart pendant from the Thomas Sabo Love Bridge collection features an engraving of LIVE LOVE LAUGH with Cubic Zirconia accents. Each Love Bridge pendant comes with a complementary engraving on the reverse. Let us know what you'd like engraved in the special comments box at checkout. This style can fit up to 3 characters.